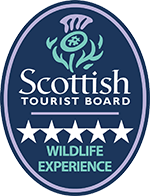 Highland Wildlife and Birdwatch Safaris have been providing wildlife tours in and around the Cairngorms National park since 2004. A Land Rover Discovery 4X4 is used for the safaris. Clients can observe the wildlife from the vehicle at some sites, however to obtain better views of some of the wildlife, exiting the vehicle is usually required and sometimes a little light walking is involved. All ages are welcome, but if your children need to travel in a baby carrier, child seat or booster seat, you will need to advise us and bring your own. To aid the less mobile in entering/exiting the vehicle, it is fitted with height adjustable air suspension and side steps. Please see the demonstration video below. If you have a medical condition or mobility issues, please notify us when enquiring, as we can usually advise on whether we can accommodate, and can usually plan an itinerary to suit. We offer a comfort (toilet) stop each time we are near 'civilisation' on our safaris, though it can be an hour or more between these opportunities. If you are based in and around the Aviemore area we can usually collect you from your accommodation. Alternatively we can meet you at the local train/bus station if you are using public transport or at a local pre-arranged site if you are travelling here by car. Aviemore has ample car parking facilities and public toilets and lots of shops and cafes. Click here for Aviemore public transport timetables. Aviemore is situated just off the A9 approximately 30 miles south of Inverness. The guide will be identified by corporate clothing and an ID badge. Don’t worry, he’ll be looking out for you. The vehicle will be identified by door signage and side and rear windscreen website banners.